Spray a 9 inch square baking pan with nonstick spray. Line the pan with parchment paper leaving a 2 inch overhang; coat with nonstick spray. For the bars, mix in a medium bowl the flour, sugar, baking powder and salt. Using a pastry blender or fork cut the butter into flour until the size of small peas. Stir in one cup diced strawberries and the white chocolate. In a separate bowl, whisk together the heavy cream, eggs, and vanilla. Add the flour to the mixture, blending with a fork just until the dough comes together. Press the dough onto the bottom of the pan. Spread the fig jam over the dough then spread the remaining dough over the top. Sprinkle with sugar and bake until lightly golden 35 to 40 minutes. Cool to room temperature then cut into 12 bars. For the topping, puree 3 cups of the strawberries in a food processor. Reserve 2 cups. Combine 1/3 cup granulated sugar and cornstarch in the saucepan. Stir in 1 cup of the pureed strawberries, water, and a pinch of salt; bring to a boil and cook until thickened stirring constantly about three minutes.Stir in the food color if using and remove from heat and let cool slightly. Maybe refrigerated until ready to serve. 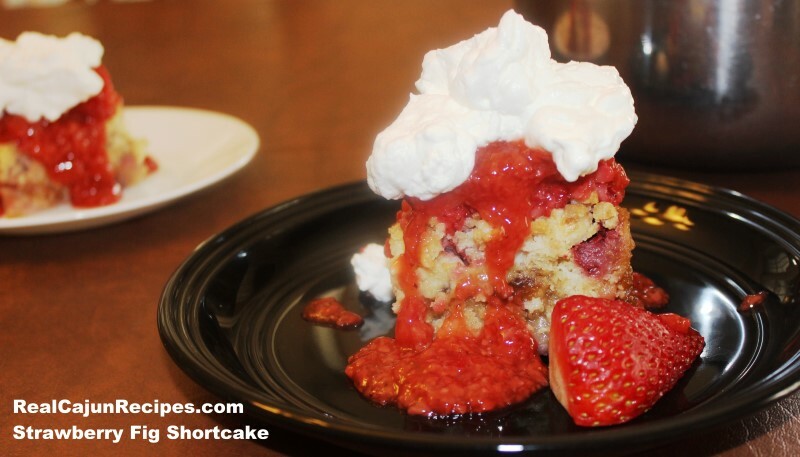 Top bars with fresh strawberry; pour sauce equally over the 12 cut bars. With the remaining pureed strawberries pour over the bars and top with whip cream. Garnish with fresh strawberries.